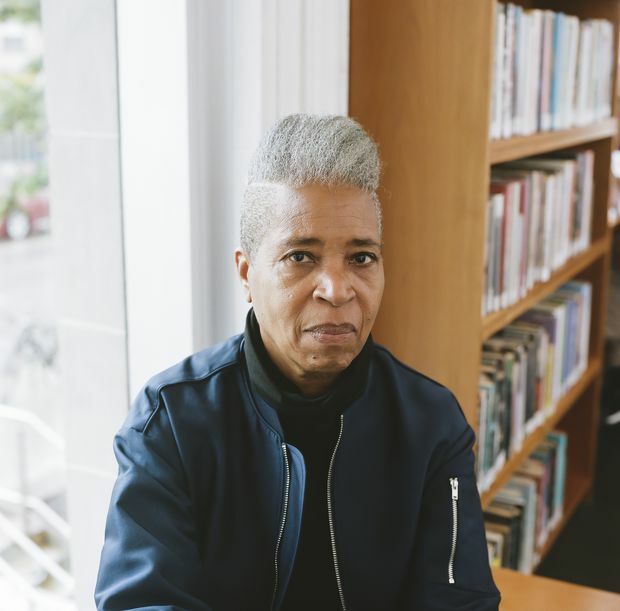 Sharply dressed in all black, her hair a gorgeous swoop of gravity-defying gray, Dionne Brand takes the stage at her book launch only to thank her co-conspirators and then hand it over. This simple act is a meaningful reveal: The prolific Canadian writer is gracious, endlessly curious and eager to push the intellectual boundaries of her audience. Brand introduced two new books at the Art Gallery of Ontario in Toronto at the September launch. The first is Theory, a novel about a PhD student crawling toward completing a dissertation. The other is a volume of poetry about the act of writing itself, called The Blue Clerk. While her latest works don’t directly speak to one another, they both address the creative process – how ideas are formed, how those ideas are presented and which words ultimately appear on the page. More than that, though, her work leads to a greater conversation Brand wants us to have about the need to break free from the categories that constrain us – gender, race, class. And certainly, her art is affecting. “Sumptuous and demanding,” is how participant Warren Crichlow, an associate professor of education at York University, described The Blue Clerk on stage that night. After the discussion, Brand treats the crowd to brief readings. When she finishes an excerpt from The Blue Clerk, an elderly man turns to his seatmate shaking his head, saying “so good,” while a young twentysomething looks at her gaggle of friends, her face bathed in the blue light from above, flooded with wonder. That is the magic of Dionne Brand. “You’d think by now I haven’t withheld anything as an author,” Brand says with a laugh. The 65-year-old has been publishing poetry, fiction and essays for four decades. 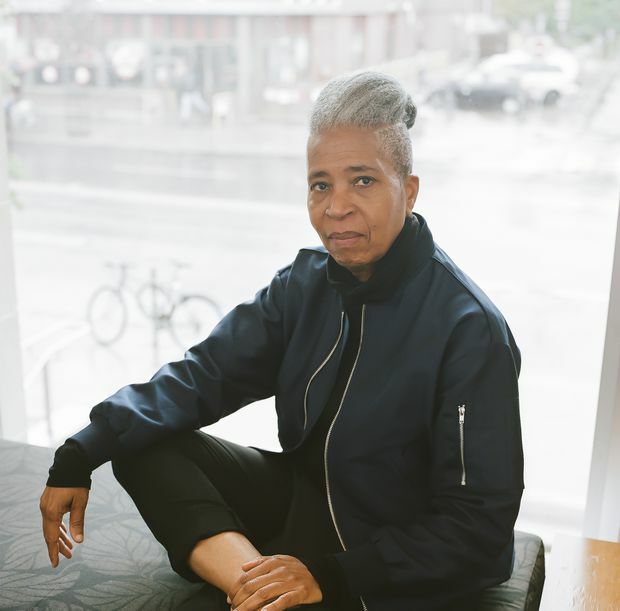 The many honours recognizing her work include the Griffin Poetry Prize for the collection Ossuaries, being selected as Toronto’s Poet Laureate from 2009 to 2012 and named to the Order of Canada last year. In Theory, Brand gives voice to a narrator who doesn’t ascribe to gender, known only as Teoria – a tortured academic perpetually led off course by a series of lovers, who each take the “all-knowing” narrator by surprise. Full of wry humour and biting critique, Theory is a masterful work from a writer who still knows how to have fun. Theory’s narrator attempts to live outside the bounds of the societal constraints pinned on them by their various identities – refusing to dim their ideas to appease academia’s limited idea of a thesis, avoiding heteronormative ideas of what a romantic partnership should look like and shaking off gendered expectations in every other aspect of life. With Jordan Peterson’s book adorning the entrance of the publisher’s office where we have our conversation, I ask Brand about her narrator and why she thinks people have such trouble thinking outside of gender. This is the gift Brand gives us through her characters and how she lives her own life: She provides us with models of how to live outside the categories assigned to us. In Theory, it becomes clear how difficult that can be, even in institutions that pride themselves on “inclusivity.” Brand, who teaches at the University of Guelph, presents a fierce critique of academia and how the framework it’s built on doesn’t allow all students, particularly those of colour, to fully participate. Her character insists their PhD committee will never understand their thesis, and what may seem like plain narcissism offers a layer of truth. “The knowledge that the character cannot be folded into the institution and the institution cannot hold the knowledge the character has,” she says. Brand’s writing shows a deep understanding of the limitations of the structures we live in, and who has the privilege to be published as a result. No writing is neutral, she says, and it’s important to recognize the consequences created by narratives that invariably leave large swaths of the population out of them. On one hand, Brand’s writing is simply describing what and who interests her. On the other, it represents a deeply intentional effort to fill those gaps. Reducing this great act to a category under “diverse lit” would be a disservice to the depth of her work. When I ask her if she worries the current effort to ensure diversity in publications is simply a cyclical trend, her soft expression turns to clear distaste. “Diverse from what? Diverse from human?” she asks. In her view they’re simply a way “to add some here and there” while the underlying power structures remain intact. This kind of enactment of diversity was on a full display a week after our conversation, when an art school in Lyon, France, was found to have altered white student’s faces to appear black in its U.S. promotional material. Her words “here and there” rang through my head while reading the story about a marketing ploy to attract a population to the kind of institution, that Brand might say, wasn’t built for them and likely cannot hold them. Brand’s book launch was a glimpse into this world – what happens when a writer is more interested in her readers than her writing, when readers feel seen, where thoughts otherwise interpreted as radical are spoken like plain truths. Her rapt audience, who met her ideas with roaring applause, reveals a deep, unfulfilled desire to enter this world. Brand created an energy in the room sure to help us get there.